Coco is, quite possibly, Pixar’s most colorful and beautifully animated feature to date. Disney’s Multi-Screen Edition contains the film on Blu-ray and DVD, plus an extra Blu-ray disc full of extras, and a digital copy to boot. 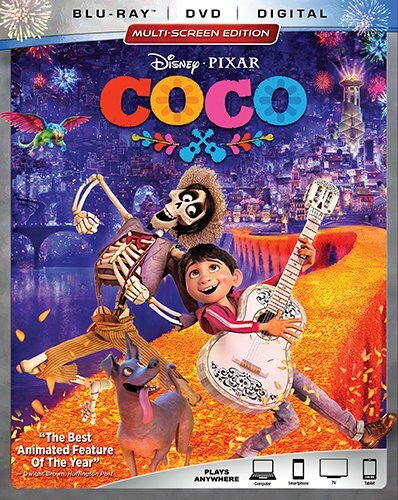 Although Disney is releasing Coco day and date in 4K UHD Blu-ray, a review copy did not arrive on time. And that is a shame, because I kept saying to myself as I viewed the film on Blu-ray, that this looks great for a Blu-ray, I can only imagine how much more colorful the UHD version would be. That is pretty high praise for this disc, if you think about it. Presented in its theatrical aspect ratio of 2.40:1 and AVC-encoded at 1080p, this is most definitely a reference quality transfer for the format. Colors are rich and vibrant without blooming or banding. Detail is exquisite, from the fine hairs on Miguel’s head to fabric textures in the costumes, grain in the wooden desks, the minute decorations in the make-up on the characters populating the land of the dead, to the fur on Dante and the various animal spiritual guides. Contrast is excellent from the bright whites of the bones of the dead to the deep blacks in the darkened passageways. Coco on Blu-ray defaults to an English DTS-HD High Resolution 5.1 track encoded at 2.0 Mbps. There are also DTS-HD Master Audio 7.1 and Dolby Digital 2.0 stereo English tracks to choose from in addition to Dolby Digital 5.1 options in Spanish and French and Dolby Digital 2.0 Descriptive Audio. I viewed the film in my 5.1.2 Atmos room and selected the 7.1 DTS-HD MA track with Dolby Surround activated on my Denon receiver. The result was a nicely immersive experience. The front soundstage was wide and expansive, with dialogue panning along with the character’s movements on screen. Surrounds were very active, adding atmosphere such as crowd noise during quieter passages and more discrete effects like the spiritual guides flying overhead during more active sequences. Dynamic range is excellent, adding greater fidelity to much of the music and songs featured in the film. Dialogue is always clear and takes priority over other elements in the mix. I just wish Disney would start including Dolby Atmos or DTS:X soundtracks rather than the numerous, and often redundant additional mixes (7.1, 5.1, 2.0, etc.) on these more recent theatrical releases. This is a three disc set, with the feature on both DVD and Blu-ray, and the bonus features spread over the two Blu-ray discs (one is dedicated solely to special features). Feature: The film in 480p with English Dolby Digital 5.1 and 2.0, Dolby Digital 2.0 Descriptive Audio, and Dolby Digital 5.1 Spanish tracks. Bonus Features: Only the audio commentary and Dante are included on this DVD version. Coco earns high marks mostly for its technical achievements rather than its story content. Video and audio are reference quality, as expected on a Disney/Pixar release. I’d certainly like to add this to my collection but 35 dollars Canadian and no 3D copy.in the 4K version sure.makes the decision not to purchase a.lot easier. Thanks Igor. My 3D copy arrived today and I just finished watching and am very happy I splurged for it. The 3D really adds to the hallucinogenic visuals. Very bright and splendid colors and a great sweet story Sadly only available on eBay. To each their own, but I don’t agree with this assertion at all. I think Coco’s story ranks with the upper tier of Pixar films. I also was not expecting much from the movie and honestly came out thinking it’s the studio’s best movie since Up (I don’t love Toy Story 3 like some, and think Inside Out is just very good as opposed to great). I think Coco is one of the four or five best they’ve made. Very much looking forward to nabbing the Blu of this. Has anyone noticed any weird coloring during the scenes in the Ofrenda room? When viewing the blu-ray, the scenes appeared abnormally orange saturated to me. Don't recall this from seeing it in the theaters. I'm assuming the coloring is due to the lighting coming from all the candles in the room, but it just looked very odd to me vs how I recall seeing it on the big screen. I didn't notice any odd coloring during other scenes in the film, just the Ofrenda room ones. Perhaps it's my tv settings, but wanted to get others' opinions.